Colin Dunne is a virtuoso traditional Irish dancer whose latest work, Concert, presented in the intimacy of The Barbican’s Pit as part of Dance Umbrella, is a homage to the virtuoso traditional Irish fiddler Tommie Potts. Potts was, according to the program note, a ‘singular and complex figure in the history of Irish traditional music’ who died in 1988 and whose sole album recorded in his lifetime, The Liffey Banks, is the basis for Dunne’s work. The album ‘reflects the complex contradictions in Potts’ musical career: his deep appreciation of traditional music alongside a desire to break it apart.’ The same two artistic poles might describe the arc of Dunne’s carefully constructed dance homage. Dunne first heard the music in 2001 while studying for a Masters in Contemporary Dance at the University of Limerick, so Concert is a project he has been considering over many years, collecting and refining his ideas. With the help of director Sinéad Rushe, sound designer Mel Mercier and lighting designer Colin Grenfell, he has organized his research as a sophisticated experiment in what appears to be a converted shed strewn with musical and dance materials — three plywood sheets of flooring, a turntable with the vinyl copy of The Liffey Banks, a piano, a fiddle, shoes, floor microphones, a cassette recorder and various speakers. At the start he lays down his terms of engagement with a brief demonstration close to the front of the stage to give an idea for those in the audience like me who hadn’t seen him in Riverdance of the basic rhythmic patterns of traditional Irish step dance. Unfortunately I am in the third row and if I can see the rhythms of the dance distributed throughout his upper body his footwork is obscured by the two rows in front. As it progresses, however, it is clear Concert is conceptually and intellectually post-Riverdance; Dunne places himself in relation to traditional Irish dance in the way Potts did in relation to traditional Irish fiddle music. He describes Potts’ music as ‘slippery’ and his homage is in part to render its rhythmic irregularity in choreographic and theatrical form. With the help of Mercier’s sound design Dunne brings to the stage the voice of Potts himself talking about his music; there is a synchronicity between the two. With adept editing they strike up a conversation that places them in the same aural universe. When Dunne later balances a sheet of plywood on its edge and has a video of Potts playing projected on to it, the two also share parallel physical universes. Mercier also plays with the autonomy of the various audio sources; in constructing his concert Dunne has to will his turntable to present Potts’ album as if the two are sharing their respective knowledge and experience, jamming together and exacting the same standards of reverence and relevance for their respective arts. He is in effect conversing with whatever drove Potts’ musicality, his rhythmic structure and notes, and he digs into his own dance as if interrogating Potts with an enthusiasm and drive that motivates his interpretations. Concert is not simply about a meeting of minds, however; Dunne is reflecting on his own understanding of Irish dance and where he might take it. 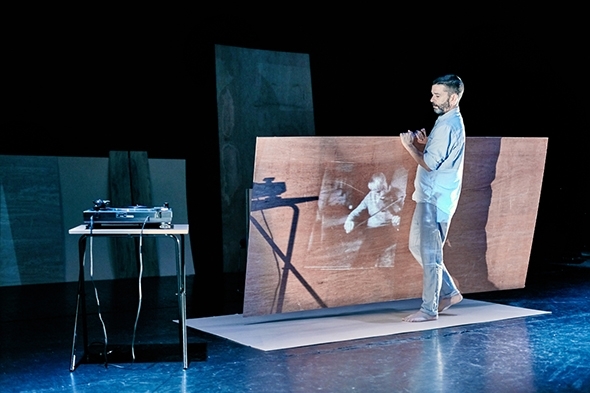 In bare feet on a piece of plywood with the use of floor microphones he explores the rhythm of steps and sound patterns as if to share with Potts what he is working on. He experiments with sampling the sound of his footfall along with his whistling and musical phrases on the piano and fiddle, creating an intriguing soundscape that accompanies his steps. Through Mercier’s adept editing, Potts offers his own characteristically terse critique. But if Dunne’s communion with Potts has its personal, almost esoteric aspect, Concert is also an occasion for him to defy the accepted belief that the jigs and reels Potts recorded on The Liffey Banks are undanceable. It’s a challenge Dunne takes on with passion and humility. When he dances we see him entering into the music as if called by a siren into slippery, dangerous waters; he demonstrates his skill by resisting any possibility of being pulled down by the current. The effect is a buoyancy of footwork and mental agility that merges the idiosyncrasies of musician and dancer into a riveting performance within a performance.